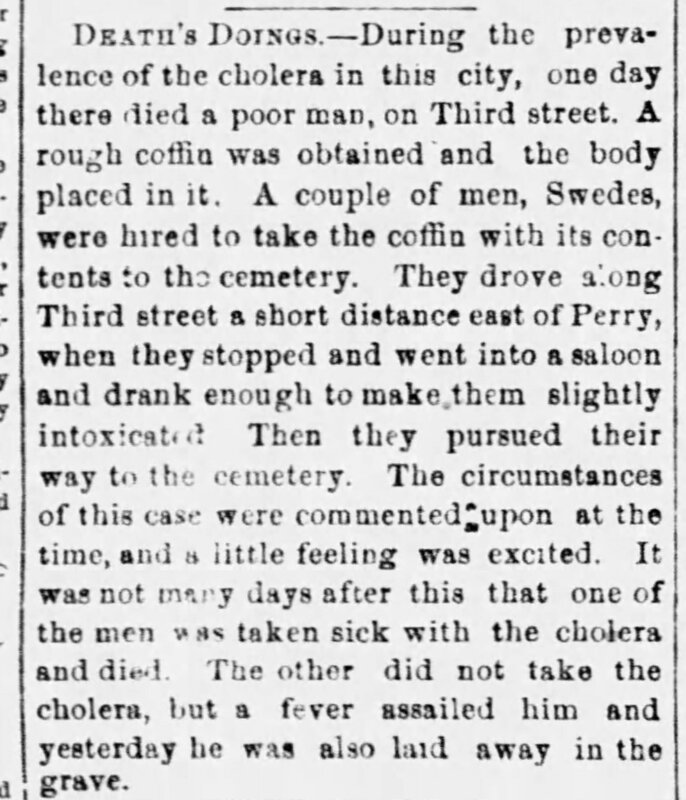 Cholera was not a new visitor to Davenport in 1873. A few short years before in 1866, Davenport suffered from an outbreak of cholera. The spread of cholera, as mysterious as it was at the time, has a simple explanation: the water. Before water was identified as the tool that transmitted cholera, there were several theories of how cholera spread. The predominant belief was that cholera spread through unpleasant, unhealthy smells or miasmas. Odoriferous air or vapors were believed to have noxious effects on those who breathed it. This theory dates back to the Middle Ages and persisted until the middle of the 19th century. In an attempt to reduce the effects of miasmas, many towns and cities enforce Nuisance Acts or advisement to rid their homes, streets, and rivers of materials that caused foul smells, and Davenport was no different. In many of the articles, there were statements about cleaning up dwellings, streets, and alleys. In addition to cholera’s mysterious spread, it also was confusing because of its various names. There were three names or types of cholera: Asiatic Cholera, Cholera Morbus, and Cholera. To make the situation even more confusing, some of the reported cases were not diagnosed as “real cholera” because they were cases of illnesses with similar symptoms to cholera. 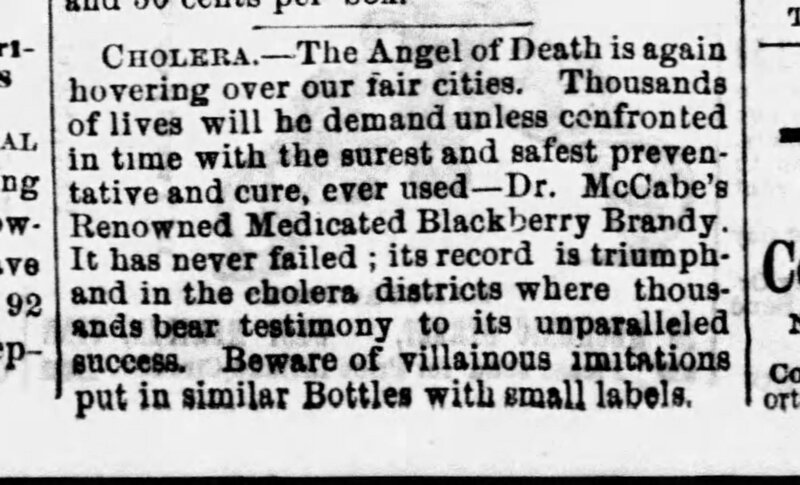 “The Cholera Scare.” Daily Davenport (Davenport, IA), June 7, 1873. By the 1850s, there were more scientific answers to the cause and spread of cholera. In the article, “Cholera: The Subject Discussed in the British Medical Association,” the author relates contemporary thoughts on the mitigation and transmission of cholera. Dr. John Snow, a scientist from England, was attempting to prove how cholera was being spread through its victims because he noticed cases of cholera springing up in neighborhoods formerly untouched by cholera. Through his studies, he realized the connection was the consumption of water contaminated by feces of infected persons. Daily Democrat, September 17, 1873, page 2. An article further link water to the spread of disease. 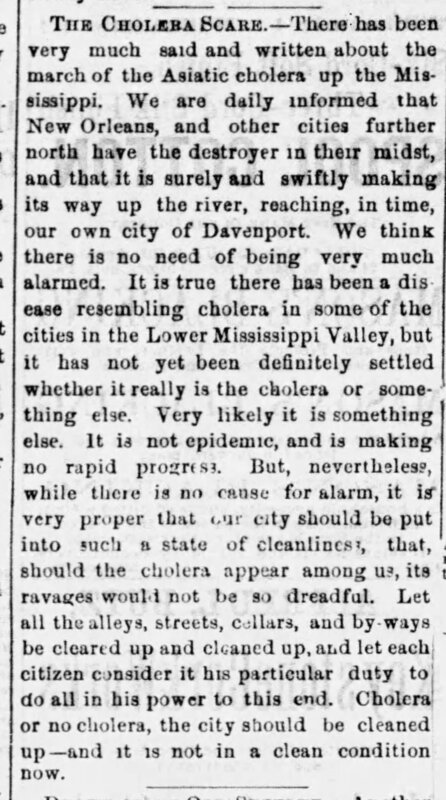 “Water and Disease.” Daily Democrat (Davenport, IA), Sept. 4, 1873. 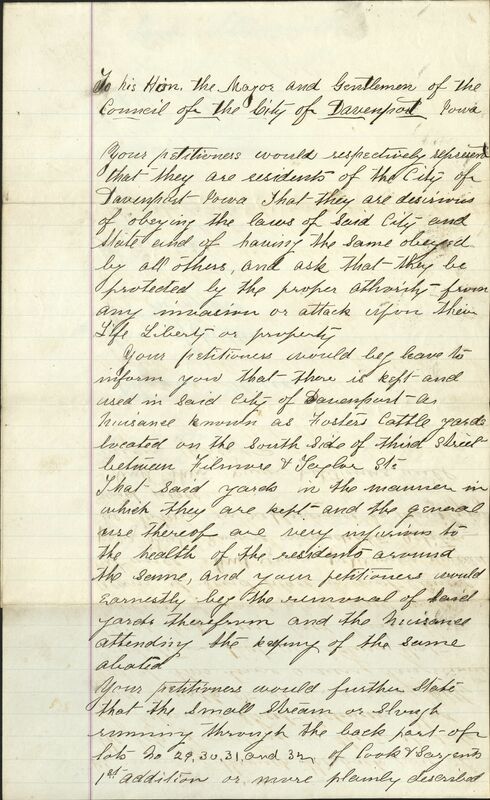 Although the cases of cholera did not reach epidemic numbers, Davenport citizens felt its effects. Articles in the Daily Democrat express the deep sorrow at the loss of citizens young and old. Some of the stories were more elaborately described than others, such as, “Taken Away in His Youth,” an article about a twenty-year-old man named, Christopher Brown. Death of Christoper Brown. “Taken Away in His Youth.” Daily Democrat (Davenport, IA), Aug. 29, 1873. The bodies of the deceased were treated in various ways. Some were buried per the family’s wish and other were cremated to prevent the spread of the disease. “Death’s Doings.” Daily Democrat (Davenport, IA), Oct. 7, 1873. Even though many articles about the cases of cholera in Davenport stated no need to become alarmed, they did warn to be vigilant about cleanliness. 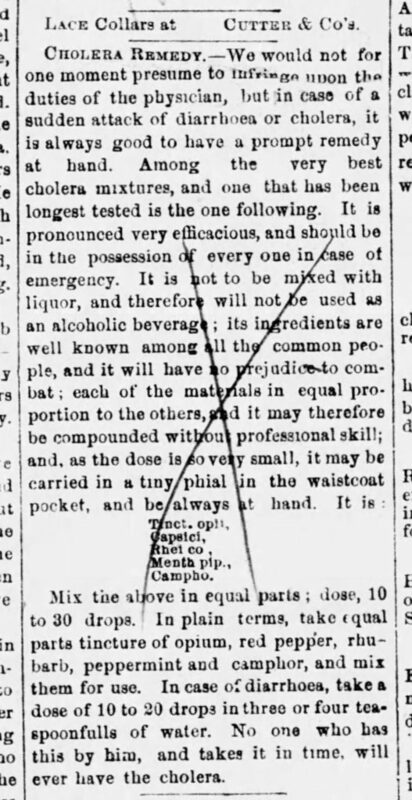 Another way people of Davenport could protect themselves were the various tonics and supplements advertised in the Daily Democrat. Many used suggestive descriptions of cholera and its effects. Dr. McCabe’s Renowned Medicated Blackberry Brandy. “Cholera.” Daily Democrat (Davenport, IA), Aug. 29, 1873. “The Great Disinfectant.” Daily Democrat (Davenport, IA), Jun. 1, 1873. “Starch. 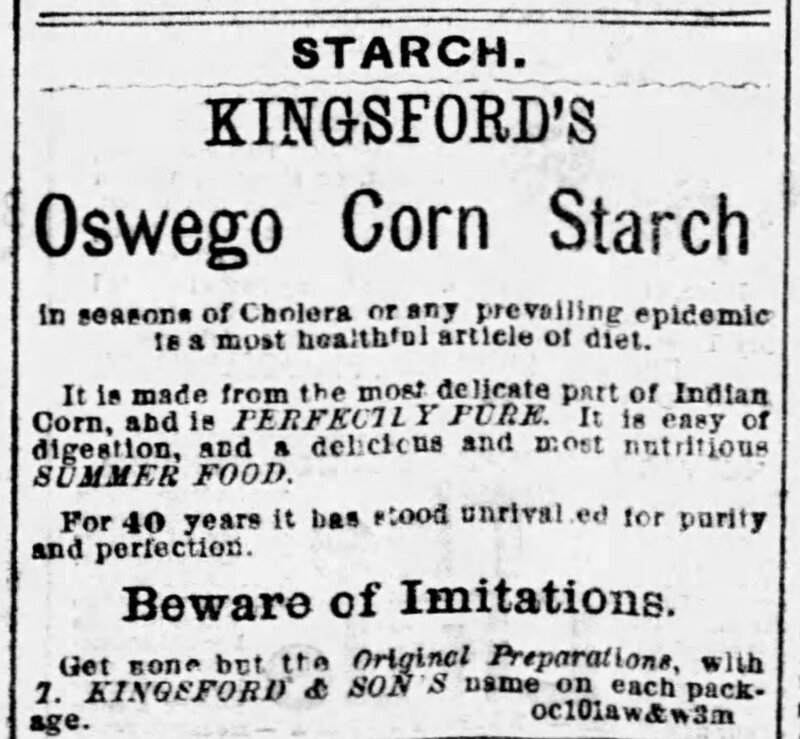 Kingsford’s Oswego Corn Starch.” Daily Democrat (Davenport, IA), Nov. 29, 1873. 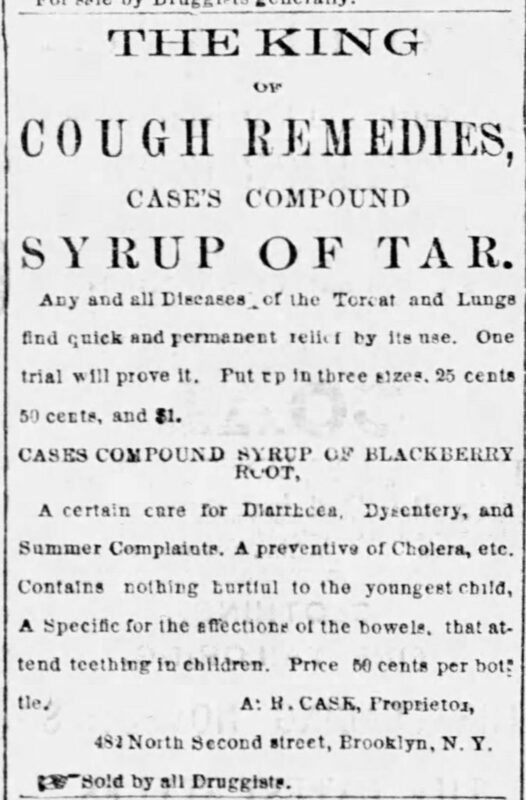 “The King of Cough Remedies, Case’s Compound Syrup of Tar.” Daily Democrat (Democrat, IA), Jul. 24, 1873. This cholera remedy uses ingredients like camphor, red pepper, peppermint, and a commonly prescribed medicine of opium. The success rates of these remedies are unknown. During the 18th century, modern medicine’s treatment of infectious diseases improved through scientific advances. Cholera did appear in Davenport again, however, through means of better sewer systems and waste disposal the spread was mitigated. In the late 1800s, concerned citizens appealed to the City Council to allow them to install sewers and drainage systems. Below are letters from our Davenport City Council Papers collection. 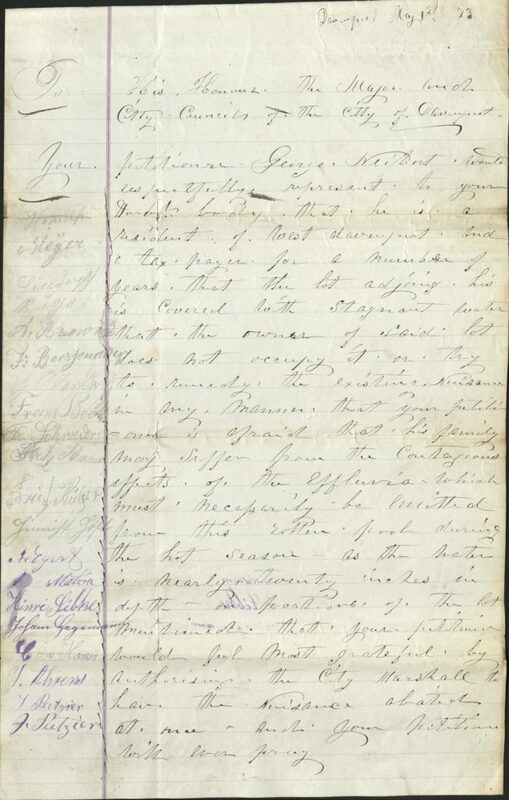 This entry was posted in Local History and tagged 1873, cholera, Davenport City Council Papers, Disease, sanitation. Bookmark the permalink.